House fires can occur at virtually any time for a variety of reasons and when they do, they cause a substantial amount of destruction, especially in the dry climates of Arizona that could leave a home devastated and dangerous to inhabit. Very few homeowners are prepared for a disaster of this magnitude and the losses from a fire may include valuable possessions or even the lives of loved ones. It is important for homeowners to know what to do next after a fire to work through this disaster and reclaim their lives. The following is a guide to help homeowners recover from the initial effects of a fire and get their lives back on track. The first priority after a house fire is extinguished is to make sure the property is safe or secure. Do not enter your house until the fire department gives you permission because fires may reignite or compromise the structural elements of a home, creating a very dangerous situation. You should make two calls as soon as possible after a fire; one to your nearest family members to let them know what happened and one to your insurance company. The insurance company will help you take the next step of the recovery process by minimizing the damage, creating a list of personal belongings that were damaged or lost, keeping your home secure from further damage, and finding a temporary housing solution. They will also get a complete assessment of the total damage to your home from a home inspector. If you have lost any important documents in the fire such as a driver’s license, passport, or social security card, make sure to replace them immediately. Once the fire department allows you back into the home, take plenty of photographs of the damage and give them to the insurance company to help them assess the damages. Whether the damage to your home requires a remodel or a complete rebuild, the work is best left in the hands of professionals like ServiceMaster All Care Restoration. It takes an experienced and certified crew to restore the furnishings and working systems of a home as well as eliminate the smell that is left behind by the smoke. An experienced team of fire damage restoration experts can help you rebuild your home and restore much of the damage caused by fire, smoke and soot. 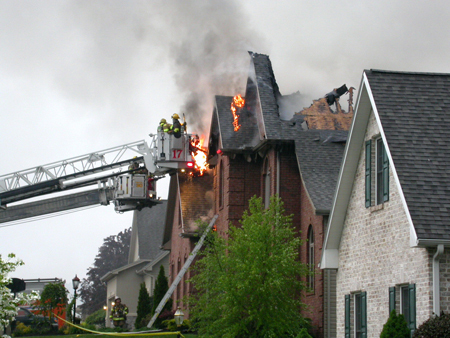 The effects of a house fire can be very overwhelming but by reaching out to your insurance company and finding a reliable crew of fire damage restoration experts, you can recover your home and get your life back on track. Next story Bathtub Refinishing – DIY or Call a Professional?